It was Dr Johnson, who, in the 18th century, said “He who is tired of Brussels sprouts is tired of life.” Humphrey Bogart made a reference to sprouts in the film Casablanca and Pope Francis recently gave them a mention in a private audience with the mercenary Tony Blair (along the lines of being able to accommodate celibacy but not contemplate a world without Brussels sprouts). The message is clear. Take these delightful green orbs seriously and they will repay you endlessly. Somewhere, under the salad, flat bread, olives, raw onion, broccoli and a mound of Brussels, lay pasta and turkey bolognese. I am now being repaid endlessly. Not a lot happening on the running front. I last went out on the weekend when I did Cambridge parkrun (5k). I missed club night on Tuesday due to family commitments but I didn’t go out yesterday despite the opportunity to do so. It’s taken me a month to get over my cold and I’ve lost motivation. Oh dear! I’ll do Cambridge or Wimpole Estate parkrun next weekend and then try to get back into the running groove. The bloody miserable weather doesn’t help. I may get a SAD light and sit in front of it looking at my watch and waiting for it to cheer me up. Not running is not a problem. My motivation will return and I’ll return to form. My level of fitness is good and won’t disappear overnight. Unless I am completely seduced by MYCOLOGY!!! Following the fungi foray I went on a few weeks ago, I am now seeing the little blighters everywhere. For example , I noticed these little chaps as I was about to get into the car. I had to prostrate myself on the grass to take this shot. It wasn’t a pretty sight, it wasn’t dignified but it had to be done. Not sure what they are. 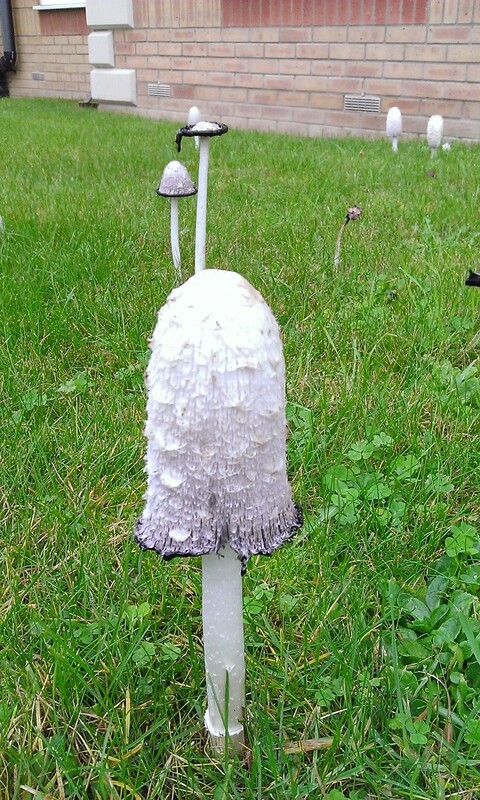 Might be a Shaggy Inkcap (or Lawyer’s Wig). I noticed this little group because they were giggling as I passed by walking Rupert the dalmatian. 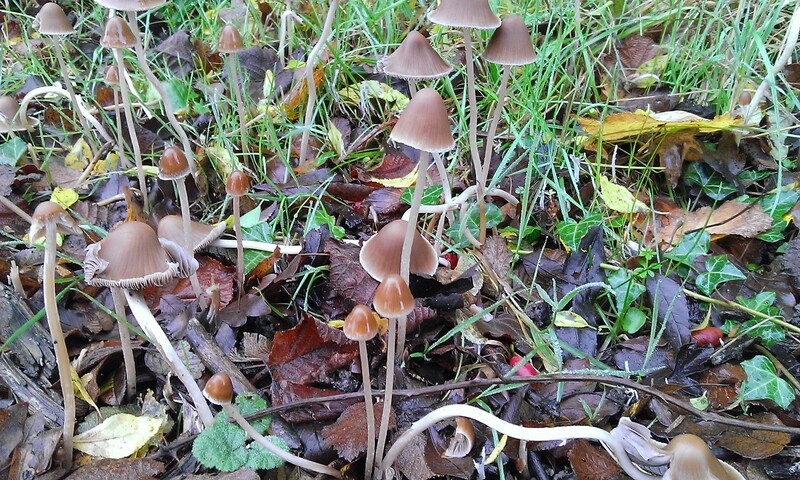 Probably from the Mycena family. I don’t know which one. See what I mean? With all this focus on fungi, it’s a distraction from running. Perhaps I’ll never get back in the running groove. They’ll whisper as I pass by “He used to be a running god. Now he’s Mushroom Man”. At the very least I’ll be regarded as a fun guy (geddit?). Before privatisation, when large swathes of industry and utilities were publicly owned, the trades unions were demonised and the nationalised industries were felt to be soft, unproductive and a bottomless pit into which huge amounts of tax payers’s was thrown. Now the unions are neutered, the companies are privatised and the nasty poor are a terrible drain on our welfare system (funded by hard working taxpayers). But there is very little focus on the extensive tax breaks, incentives, subsidies and tax avoidance methods currently in situ for privatised, (previously nationalised)industries and their shareholders(funded directly out of the public purse). The Tories and their media may bleat about Labour provoking a class war when they questioned the charitable status of privately run schools but clearly their tax concessions amount to a subsidy (or state handout) to a particular class of people. You know where you are with the Tories – well educated, cruelly self centred and very adept at scapegoating the most vulnerable in society. Tories too soft? Vote UKIP, the BNP Lite party. Gardening project update : no planning permission needed apparently although a polytunnel and a new shed are essential and these will need permission so I’m a bit confused. Awaiting clarification. Good news is that I will get a donated polytunnel and will be able to choose the size. This entry was posted in Am I Being Unfair?, broccoli, Brussels sprouts, Exercise and heart disease, food, food pictures, fungi, Gardening as therapy, gardening therapy, Grumpiness, Heart disease, Heartless Tories, hypocritical behaviour, mycology, parkrun, Pictures of food, privatisation, Running, running with heart disease, SAD, Uncategorized, unpleasant right wing politicians and tagged exercise, gardening, heart disorder, parkrun, Religious intolerance, running. Bookmark the permalink.